It is a light week for horror on TCM this week, with just a few movies on their schedule, but that just means you can save up dvr space for all the horror (and Disney) flicks Turner Classic Movies are serving up next week . Anyway, their Friday Halloween horror kicks off at 8:00 PM with Spencer Tracy, Ingrid Bergman, and Lana Turner in Dr. Jekyll and Mr. Hyde from 1941. At 10:30 PM is Charles Laughton in an amazing performance as The Hunchback of Notre Dame. Also on board in this retelling of Victor Hugo’s classic tale are Maureen O’Hara, Edmond O’Brien, Sir Cedric Hardwicke, and Thomas Mitchell. 12:45 AM brings The Fall of the House of Usher with Gwen Watford, Kay Tendeter, and Irving Steen from 1949 (or 1950, or 1952. What information I could find on this film is somewhat contradictory. Sites mentioned it was a found “lost film”, or an amateur production, or just rare. I was not even sure of the pictures I found online. The above screenshots are taken from excerpts of the film hosted on the TCM website, posted just to give a ‘taste’ of the movie). At 2:00 AM is an adaptation of Oscar Wilde’s The Picture of Dorian Gray from 1945 starring Hurd Hatfield, George Sanders, and Donna Reed . Mary Shelley’s classic tale, just ever-so-slightly reworked for Hammer by writer Jimmy Sangster, rounds out the night at 4:00 AM with The Curse of Frankenstein. 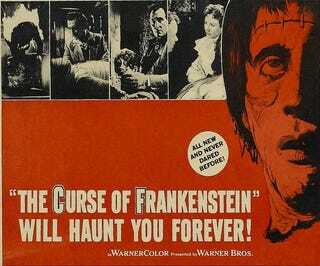 Directed by Terence Fisher this 1957 film, the first in Hammer’s Frankenstein series, stars Peter Cushing, Hazel Court, Robert Urquhart, and Christopher Lee. Not genre related but really late Saturday night or really early Sunday morning at 2:45 AM TCM Underground is showing The Decline of Western Civilization, Part III a 1998 documentary covering L.A.’s gutter punks (I have not seen the movie yet, do not yet know what “gutter punk” really means, but I am mentioning the film because it is the third part of the Decline Trilogy). And, though not TCM related, the MGM HD Nightly Apparitions midnight movies this week are, including tonight, Vampire Circus, The Fall of the House of Usher, The Raven, The Abominable Dr. Phibes, Twins of Evil, The Masque of Red Death, and The Vampire Lovers. And since I just realized that AMC is good enough this (and probably next) week to devote almost their entire schedule (that is not devoted to infomercials) to horror this week here are their offerings. Halloween (1978), Halloween II (1981), Halloween 4 (1988), Halloween 5 (1989), Halloween 6 (1995), Halloween: Resurrection (2002), then back to Halloween, Halloween II, Halloween 4, and Halloween 5. War of the Colossal Beast (1958), Freddy’s Dead (1991), Cujo (1983), Pet Sematary (1989), Thinner (1996), Tremors (1990), Tremors 2 (1996), Tremors 3 (2001), Tremors 4 (2004), and finally Pet Sematary again [I think. After that my schedule goes whacky and shows Violent Midnight at 5:15 AM, War of the Colossal Beast at 5:30 AM, Corridors of Blood at 5:45 AM, then infomercials, so who knows]. Firestarter (1984), The Shining (1980), House of Wax (2005), The Last House on the Left (2009), The Amityville Horror (1979), Amityville II (1982), Amityville 3-D (1983), Candyman: Farewell to the Flesh (1995). Amityville 3-D (1983), Jason X (2002), Scream 2 (1997), Scream 4 (2011), Child’s Play (1998), Seed of Chucky (2004), replays of Child’s Play and Seed of Chucky, Shaun of the Dead (2004), Silver Bullet (1985). Scream 4 (2011), Resident Evil (2002), Jeepers Creepers 2 (2003), The Dark Knight (2008), Halloween II (2009), Day of the Dead (1985), The Walking Dead, Talking Dead, Tai Chi Zero (2012)(not horror but Steampunk-ish), Iron Monkey (1993). The Walking Dead, Day of the Dead (1985), Resident Evil (2002), Resident Evil: Apocalypse (2004), Tremors (1990), Child’s Play (1998), Seed of Chucky (2004), Leprechaun (1993), Leprechaun 2 (1994), Leprechaun 3 (1995), Leprechaun 4 In Space (1996), Re-Animator (1985), The Walking Dead. Freddy’s Dead (1991), House of Wax (2005), Jeepers Creepers 2 (2003), Friday the 13th (2009), A Nightmare on Elm Street (2010), Freddy vs. Jason (2003), then the rest of the night is the Walking Talking Dead.